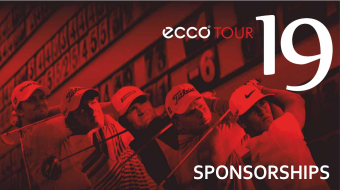 Since the beginning of the 2018 season, the ECCO Tour has switched to a digital Course Guide. Paper version Course Guides will no longer be available on the ECCO Tour. During 2019, we should be able to introduce the GLFR app-users statistics, Shot Tracking, personal pages and much more, and therefore we believe, this is the way to go. The Shot Tracking (like you know from the PGA Tour) is the main reason for us using the GLFR App. Being able to visually present shot tracking to everyone following the tour/players, will be a milestone for the ECCO Tour and for the players involved. In the digital course guide (GLFR app), you will find pin positions and the phone number for the referee. Pin positions will be available in the app the evening before your round, so you can prepare. The Digital Course Guide runs on Flight Mode once it is downloaded. However, please update every evening – using a good connection – so you have the correct version for the next day. When you use the app on Flight Mode, it does not use much power at all. From this page, you should be able to find all relevant information, and below you have links to written tutorials and an ECCO Tour player FAQ. You are also welcome to ask us questions about the app. We’re happy to help explain everything. However, this should not be done 10 minutes before your teetime. Once or twice during the season, the founder of the app, will be present at a “Players meeting”. We strongly recommend that you get familiar with the GLFR app before your first ECCO Tour event, so that you both understand the app, but more importantly so you get the most out of the app. There are a lot of areas where the GLFR App offers much more than the traditional/printed Course Guide. But it takes a little time and interest to learn these advantages. Have a smart phone if you want to use the GLFR app. Have the correct and updated version downloaded and always to have checked for updates to your course guides before a round. Be able to understand and be familiar with the GLFR in order to get the maximum out of the product. Have power on your phone or to have a power bank. The app can be used offline, but you have to check for updates between rounds, where you have to be online. We are certain that you will enjoy the GLFR app and the opportunities that come with the technology. But if you don’t, please remember that the course guide is an offer, and we are not forcing you to use it. Ingenium Golf, who are behind the GLFR app, are looking forward to your feedback and want to use it as much as possible in developing the product further. If you have any good or bad criticism, advice or maybe ideas for improvements, please let them know at [email protected] Not everyone will receive a personal respond and not all of your ideas ideas/wishes will be fulfilled, but your mails will be read and the content will be used for evaluation. All players will be kept up to date on what aspects of GLFR app are under development and on the drawing board.